Nagaland Election Result 2018 will be declared on March 3, 2018. The tenure of Nagaland Legislative Assembly ends on March 13, 2018. Nagaland Assembly Election 2018 was held on February 27, 2018. Nagaland Assembly Election 2018 was held on February 27 for 59 of 60 assembly seats. The scheduled election in Northern Angami II constituency did not take place as Nationalist Democratic Progressive Party (NDPP) founder Neiphiu Rio, also the former chief minister of the state, was declared elected unopposed. He is one of the heavyweights in 2018 Nagaland assembly elections apart from Nagaland Chief Minister TR Zeliang, former chief minister from Congress KL Chishi who has now joined the BJP, and Y Patton who was the former home minister under Naga People's Front (NPF) and is now contesting from the BJP. The Naga Accord, also known as the Framework Agreement, is one of the most important issues in Nagaland. Today's results will decide the future of the Framework Agreement signed between the armed group NSCN(IM) and the centre, depending on which party comes to power. Nagaland comprises of 60 assembly constituencies. A total of 59 constituencies are reserved for Scheduled Tribes and one for a general candidate. The number of candidates who contested the 2018 assembly elections in Nagaland is 196. Of these, five are women. After 54 years of statehood and 12 assembly elections, Nagaland is yet to see any woman representative in the Assembly. 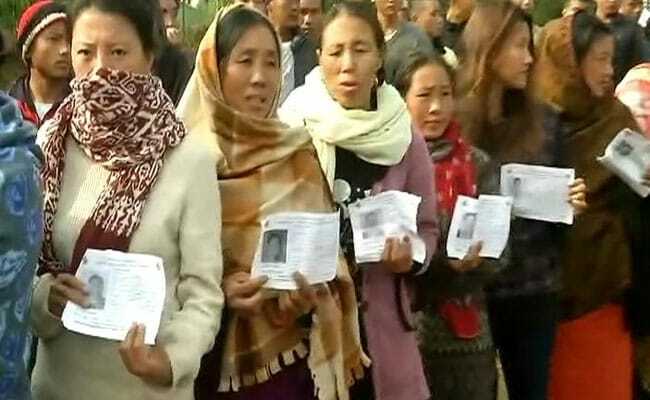 According to the State Election Commission, 11,91,513 electorates were eligible to cast their vote in Nagaland Assembly Elections 2018. Of this, 6,01,707 were men and 5,89,804 women. On 2187 polling stations, Nagaland saw around 75 per cent voter turnout as it was marred by violent clashes between supporters of the Naga People's Front (NPF) and the newly-floated Nationalist Democratic Progressive Party (NDPP). The 2013 Assembly elections turnout in Nagaland was 90.57 per cent. Four prominent parties are fighting the poll battle in Nagaland - Nagaland People's Front (NPF), Nationalist Democratic Progressive Party (NDPP), Bhartiya Janta Party (BJP) and Indian National Congress (INC). The BJP contested the elections in alliance with the newly-formed National Democratic Progressive Party (NDPP), led by former chief minister Neiphiu Rio. The ruling Naga People's Front (NPF) fielded 58 candidates. The BJP fielded candidates from 20 seats while Nationalist Democratic Progressive Party (NDPP) contested from 40 constituencies. Congress fielded 18 candidates in Nagaland Assembly Election 2018. In the 60-member Nagaland assembly elections, a party would need 31 seats to get a clear majority. Nagaland Election 2018 Exit Poll by JanKiBaat-NewsX predict that BJP-NDPP alliance will storm the ruling NPF bastion as it is predicted to win 27-32 seats with a vote share of 48 per cent, against NPF's 20-25 seats and a vote share of 42 per cent.